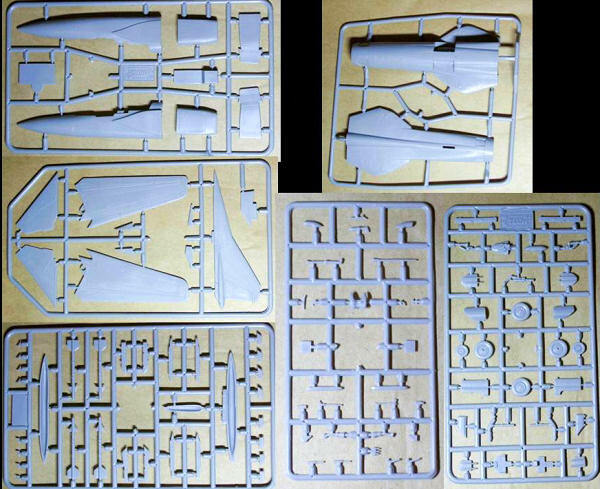 Six dark grey sprues with 73 parts, clear sprue with one-piece canopy & HUD and 3 green resin pieces. The parts look rough at first glance, but a closer inspection reveals wonderfully restrained panel line & rivet details, which perfectly capture the “agricultural” look of the Flogger without being overstated like many new kits. The canopy is thin & clear, and the resin exhaust and cockpit tubs with integral seats provide ample detail in focal areas. Note the images shown are NOT to scale, collated via PPT. 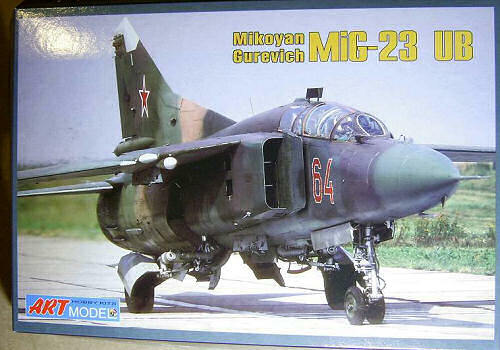 A4, the front has history in English & Cyrillic and a parts diagram, the inner two pages contain exploded assembly diagrams with all parts clearly identified and numbered and excellent multi-view schematics for more complex areas such as open airbrakes, nose gear and main gear and the back has a 3-view line drawing of stencil placement with enlargements of various stencils. Folded inside on a glossy A4 sheet are full colour painting/decal placement guides for 17 of the 18 schemes offered. 18 schemes, all wonderfully varied, provided on two small sheets with a separate comprehensive stencil sheet. 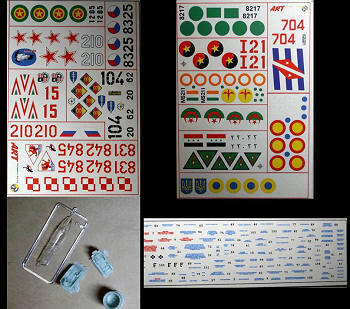 The decals are matt with minimal separate carrier film, the colour & registration is spot on.